This is the second of two articles recounting the Nedelin Disaster. Read Part 1 here. They worked all night. One bundle of wires that was removed and replaced had all their coverings melted as a result of a short circuit from the first stage’s pyrotechnic cartridge; the wires were in direct contact with each other. Propulsion engineers still weren’t sure whether the second stage blowout discs had blown, since the monitors had been distracted by the first stage; they attempted to verify the situation by smell. The morning of October 24 arrived. Nedelin was still seated by the launch pad, a position that had become if anything, even riskier. NII-4 chief General A. I. Sokolov had the temerity to suggest to Nedelin that it might be safer to move away from the fueled, poorly controlled missile; Nedelin called him a coward. The offended Sokolov left directly for Moscow, a move that almost certainly saved his life. The evening of October 24: It was time, once again, to blow the second stage discs. No longer trusting the electrical system which was clearly riddled with faults, engineers undertook to detonate each disc manually, powered by a battery carried up the service ladder. Those who survived the initial explosion tried desperately to escape while the air around the fire was so hot it melted asphalt and burnt clothing while toxic vapor poisoned those who did not burn (Credits: USSR). An ill-advised flip of a switch whose circuitry was poorly design had ignited the second stage, still on the launch pad. Its flames in turn ignited the fully fueled first stage, creating a massive fireball. The lucky ones, like Nedelin, died instantly. A video camera had been set up to record the launch; instead it recorded figures stumbling off the launch pad engulfed in flames. The fire reached 3,000°C, melting tar on the road and trapping those who tried to run. Those who didn’t bake or burn died of toxic gas inhalation. A few managed to run to the edge of the launch site, where they got tangled in the barbed wire fence intended to demarcate the safety line. 100 civilian and military personnel had been engaged in work on the R-16. An additional 150 spectators had come to watch the momentous event from up close. All but a handful of them died that day. 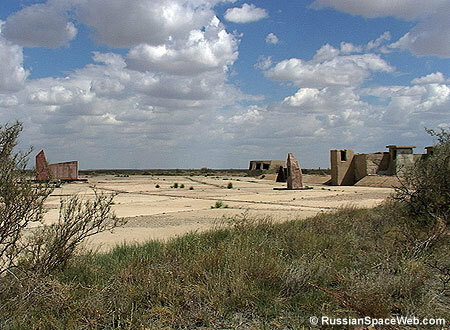 Site 41 at Baikonour Cosmodrome today is abandoned, with just a memorial stone to recall the horror that once unfolded here (Credits: Anatoly Zak/RussianSpaceWeb). It was decades before a full account of the Nedelin Catastrophe came out. Despite at least 150 people killed (the real number remains unknown, as the official death toll was either never counted or revealed), the catastrophe was completely covered up. An apparently victorious nation happily launched the first man to space just six months later. Relatives were told their loved one had died in a plane crash – only later did these relatives discover just how many “plane crashes” there had been on October 24. Bodies of military service members were buried in a mass grave on the launch site; it was not until 1963 that they were given a memorial marker. The bodies of deceased civilians were sent home to their families. Today, Site 41 at Baikonour Cosmodrome remains as an abandoned lot, with a small monument listing the names of 54 people’s remains could not be identified. It would be nice to conclude that the horrific outcome of this incident was a radical change in the Soviet approach to launch vehicle safety, but history has shown otherwise. It was not until four decades later that this account became public – and Marshall Nedelin is still seen as a Russian hero due to his World War II service, a reputation unsullied by his subsequent errors. Even those who were aware of all the facts at the time seemed anxious to forget them as soon as possible. The investigative commission, after declining to punish anyone for the catastrophe perhaps rightly concluding that anyone still alive had been punished enough, went on to demand cleanup of the launch site within 10-15 days and a fresh launch attempt within one month. In fact, the next launch attempt was three months later – and it failed too. Luckily no one died on the second time around. Let us hope that we have gained some wisdom from this particular past in the dangers of disregarding safety procedures, cutting short testing, and allowing time pressures to drive technical decisions. And let us remind ourselves of these lessons from time to time, just in case. All that was left of the R-16 and its launch pad after the Nedelin Disaster (Credits: USSR). Chertok, Boris. Rockets and People Vol. II: Creating a Rocket Industry. Ed. Assif Siddiqi. The NASA History Series. Aerospaceweb: Ask a Rocket Scientist. http://www.aerospaceweb.org/question/spacecraft/q0179.shtml. Good story! Having served in the USAF on the front lines of the Cold War(Minuteman Missile Maintenance and Missile Launch Officer), I understand the nature of the story better than most. The Soviet Political and Military systems of that time(systems intertwined and inseparable)had great rewards for those who succeeded and dire consequences for those who failed. I once read that just before the Russians detonated their first nuclear bomb, Stalin had made up two lists: One of people to be rewarded if the test succeeded and one of people to be shot if it failed. My understanding was that the lists were virtually identical. In the USAF Strategic Air Command of that era, great rewards were possible for success also, but there were also serious consequences were available for those who screwed up-though getting shot did not figure into it. Though getting shot might have been more merciful. It didn’t happen to me, but I knew those who it did happen to.